We actually went to do a site visit at Coq D’Argent a little while ago, for an event we were holding through work. Ever since I’ve been dying to go back. For the views. A few cheeky cocktails on a special occasion. 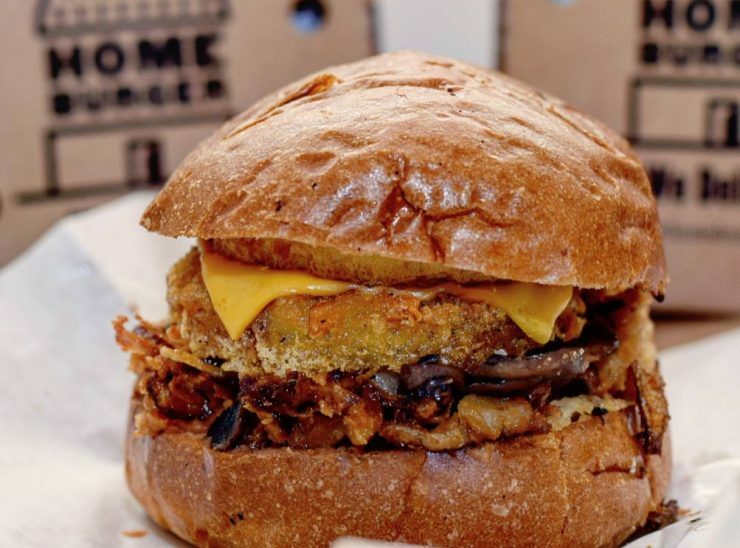 A bite to eat. Coq D’Argent is a french restaurant/brasserie at the top of 1 Poultry, next to Bank station. When you head up to the restaurant in the lift, it’s like you’re transported elsewhere. 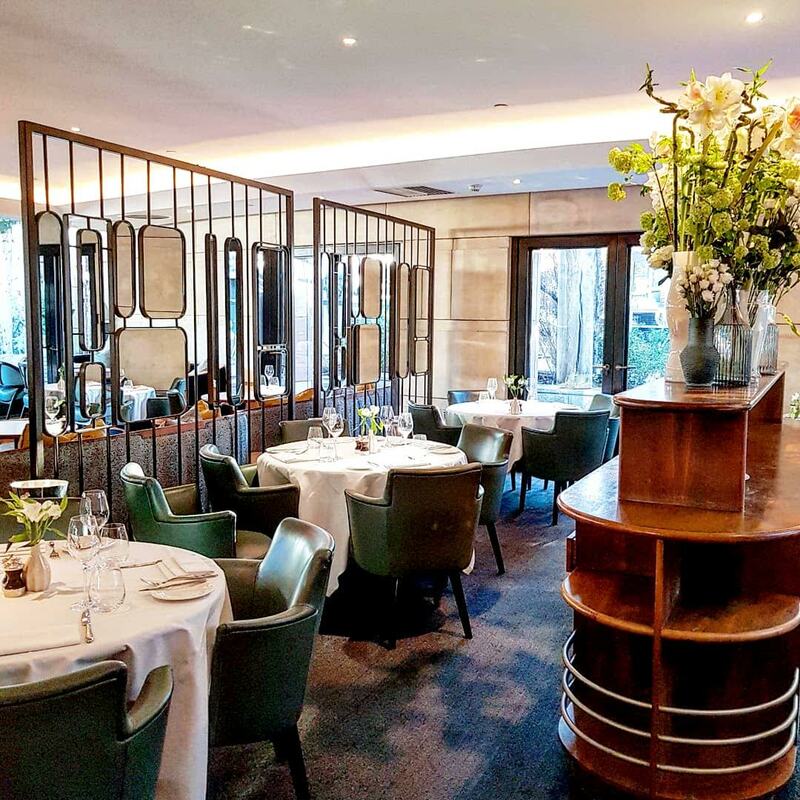 Coq D’Argent is one beautiful restaurant. It’s modern/contemporary and minimalist with a sophisticated, classy vibe. 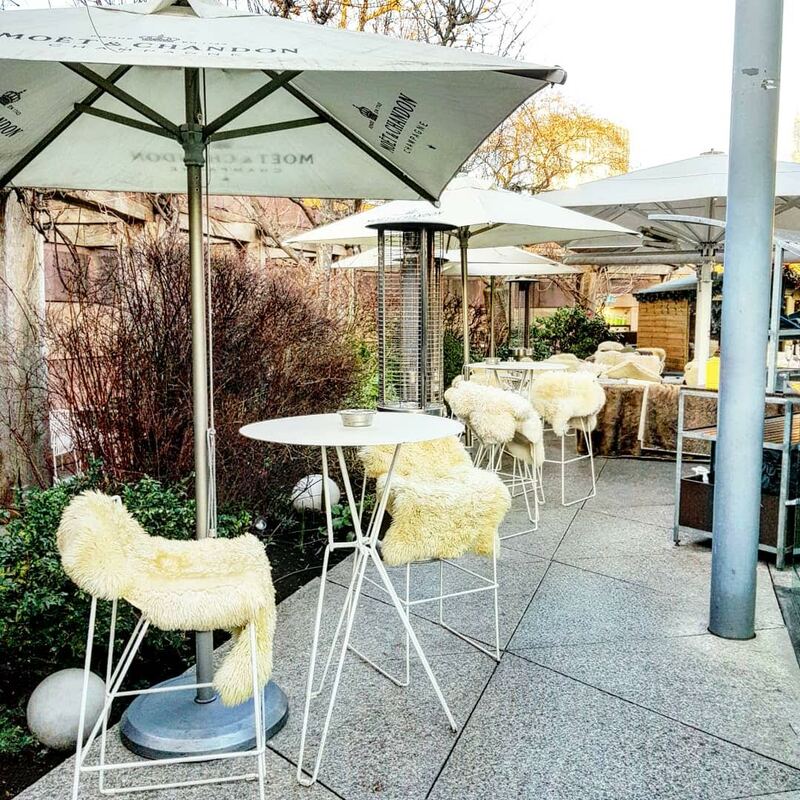 The outside bar area is super cute, with stools donned with fleeces in the winter. 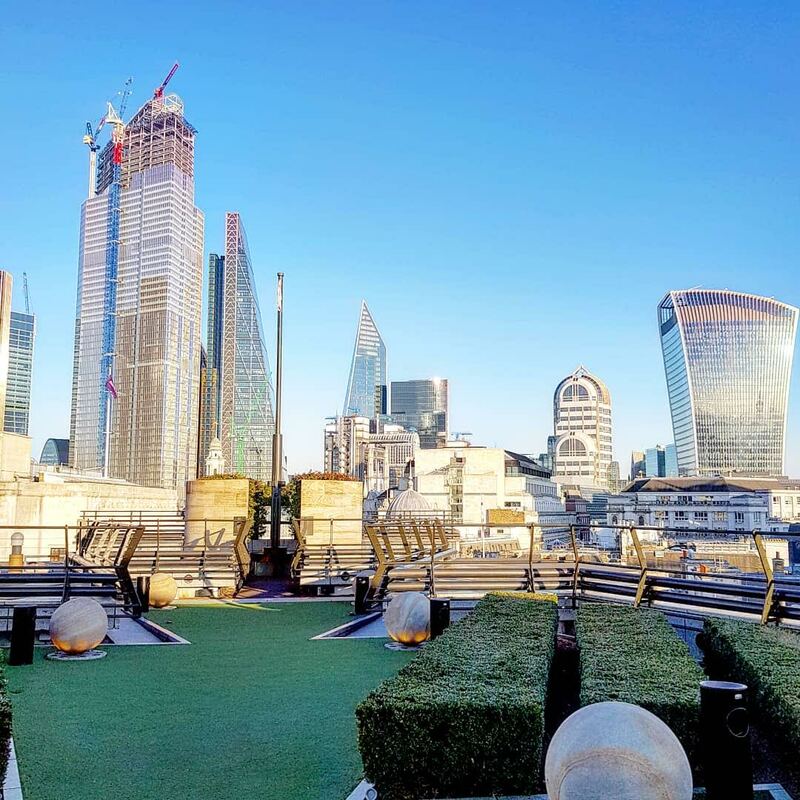 The roof garden has the most amazing views of the city, and will be open again as soon as the weather is good enough for people to enjoy a few glasses of vino on. 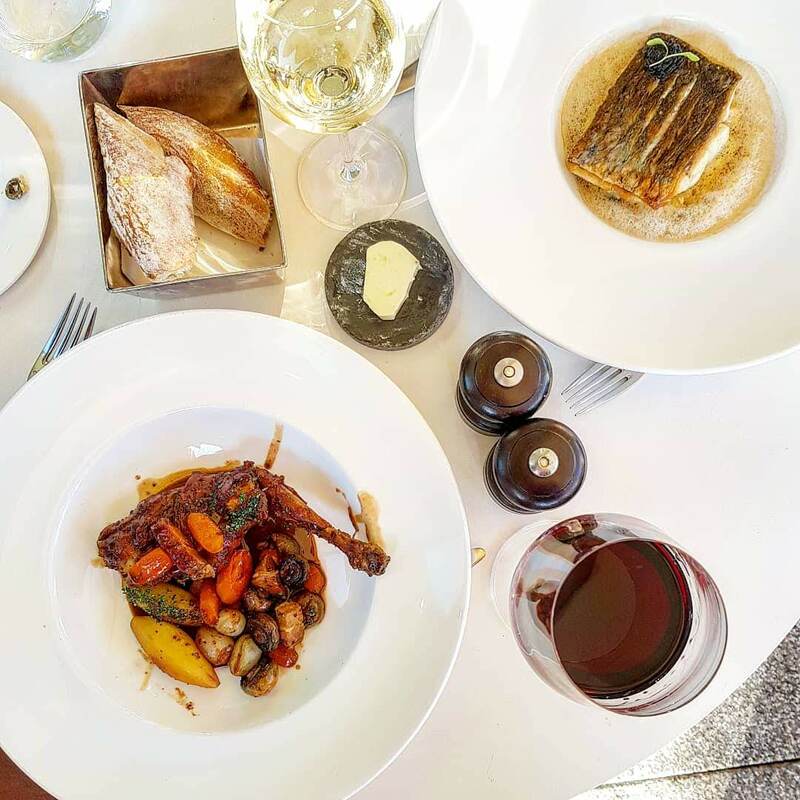 Coq D’Argent has recently launched the ‘Le Grand Déjeuner Weekend’ menu. 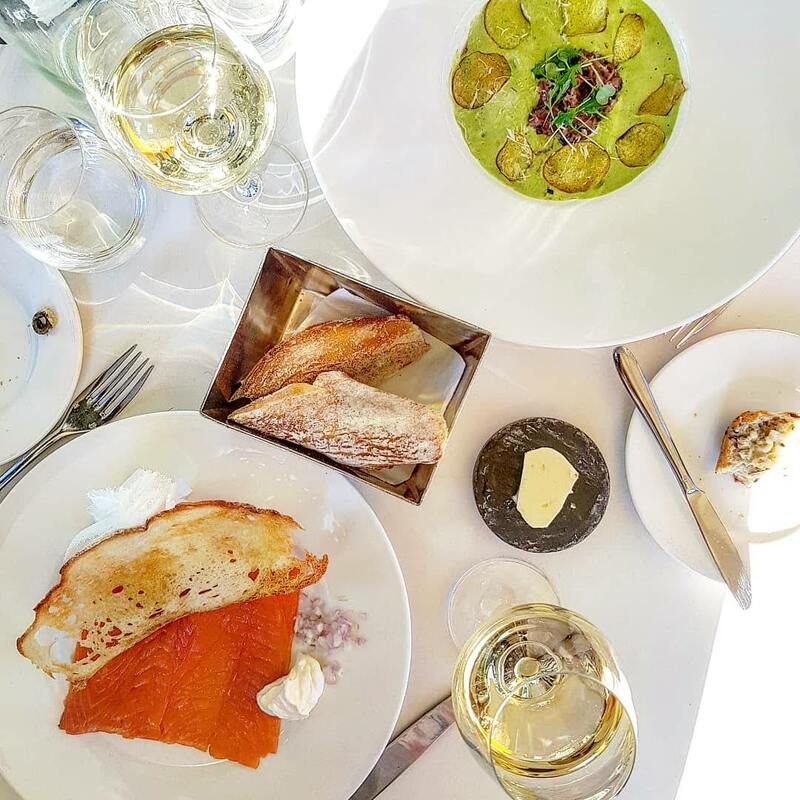 The new Le Grand Dejeuner Weekend menu, is a set menu with the option to go for two or three courses (£38pp/£43pp). It’s half price for the whole of March 2019 if you quote “hot dinners” when booking! 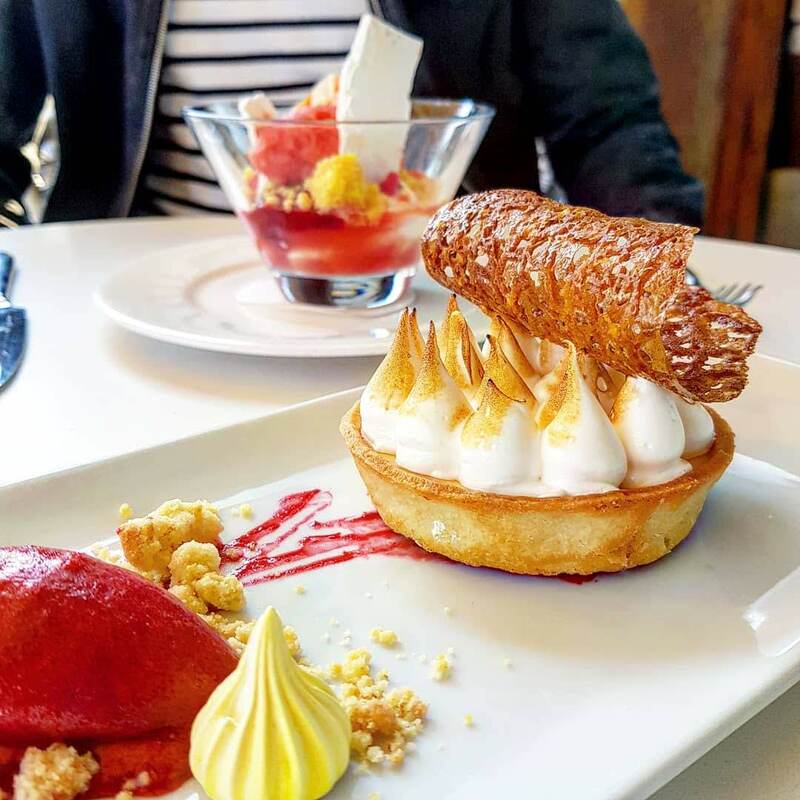 The set menu has plenty to choose from, including french classics with a twist, and creative numbers. There are 12 starters on the main menu, including a couple of vegetarian options and a vegan option, and one additional sharer, which we thought was a lot. They all looked and sounded incredible. The Saumon fumé was a beautiful light starter. The salmon was some of the best we’d had. Also served with thin, crisp melba toast and condiments, it was a fantastic choice. We loved that the lemon came in a little bag, to avoid any pulp too. The Jarret de Cochon was our winning starter however. 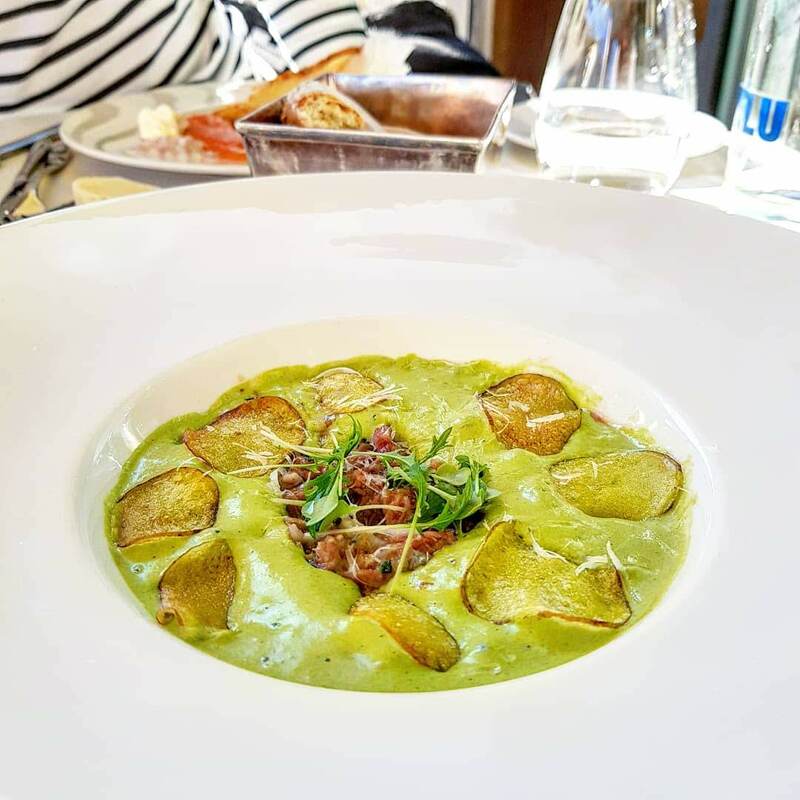 It combines braised ham hock in a pea and mint foam, with chestnut mushrooms, shallots, new potato crisp and comté cheese. It was rich and fantastic in flavour. A little like a fancier version of a pea and ham soup, yet lots more sophisticated. The ham hock was delicate, the new potato crispy adding something different to a crouton – some fab textures to add to the beautiful flavours. There were also 12 choices when it came to mains, with two additional sharing dishes. Both the meaty options and vegetarians dishes sounded fab, and there was much deliberation over which to choose. 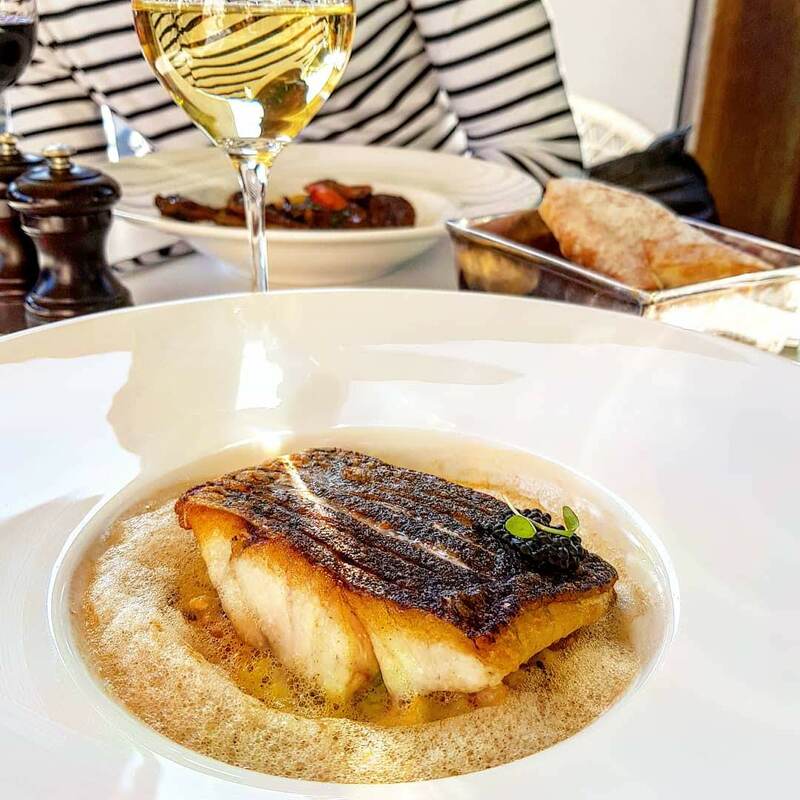 The Haut Bar could not be resisted – I’m a big fan of a really good white fish dish. A seared fillet of stone bass, with devon white crab risotto, avruga caviar and crab essence, it was one beautiful, elegant dish. The fish was tender and meaty, with a fantastic crispy, grilled top. The risotto was chunky, but not creamy. It gave the dish a fresher, lighter feel. The caviar was a nice finishing touch, and not just for presentation. The Cuisse de Lapin was a must try, as we’d never had a rabbit dish before. 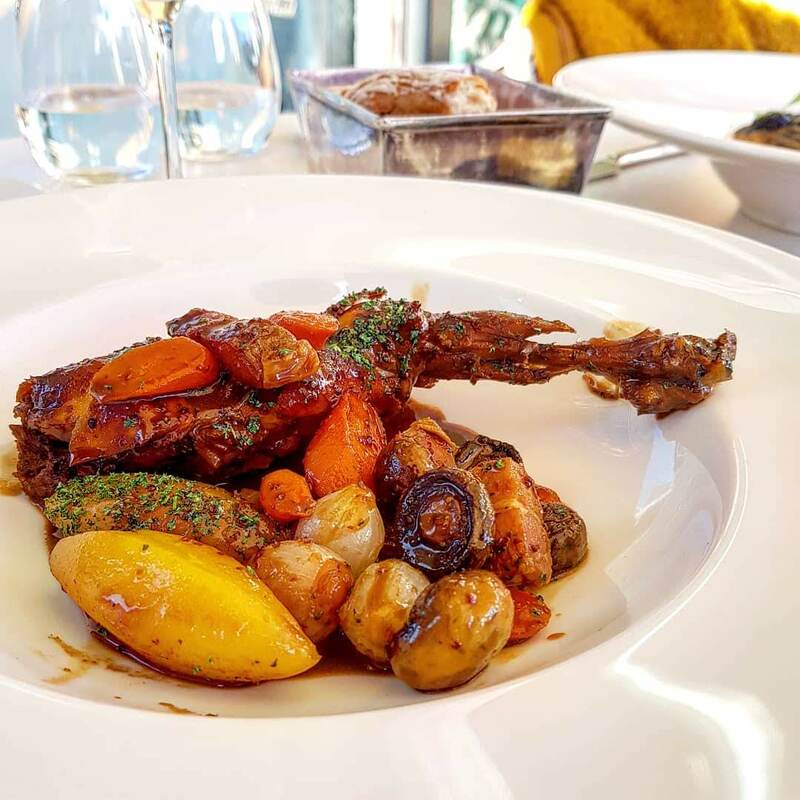 A braised french rabbit leg, it was served with bourguignonne garnish, mustard sauce and new potatoes. The meat on the brasied leg almost fell off the bone. The rabbit was super tender and pink inside and had a rich, deep flavour, which was complimented by the bourguignonne. The vegetables were a la dente, and the new potatoes beautiful too. One fab, flavoursome main which is a must try for meat lovers. Three courses is more manageable than you think, as the dishes are more on the small to moderate scale. The 13 dessert options had us sucked in – numerous creative dishes including three vegan options and a cheese board for the savoury fans. A more classic choice, the Tarte au Citron looked amazing. 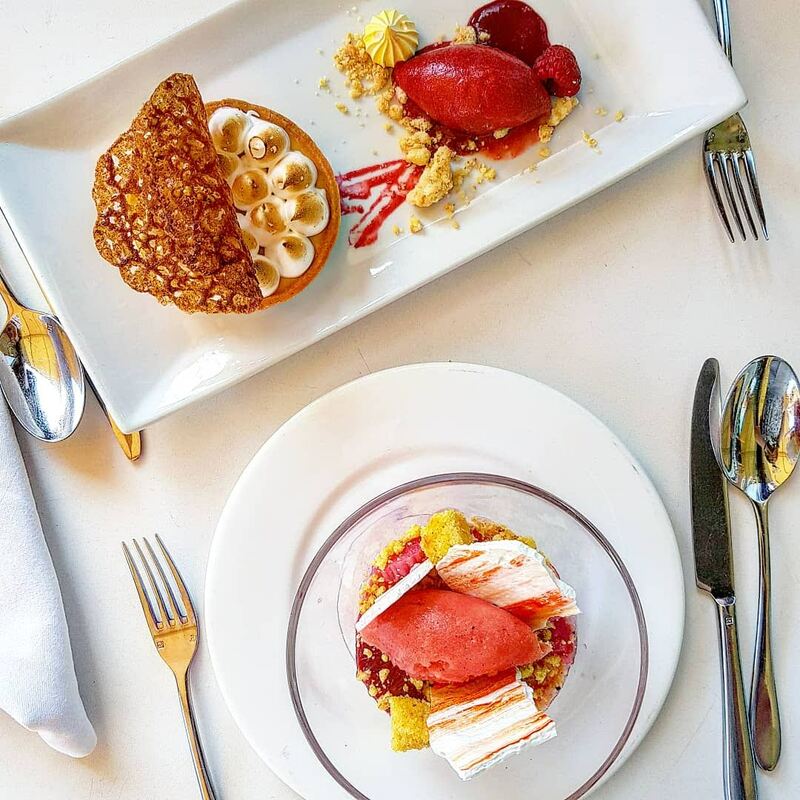 The baked lemon tart was finished with a soft meringe, and served with buckwheat and raspberry sorbet. The tart was very citrus-y, tangy and tart. The pastry was buttery, with a delicious crumble. 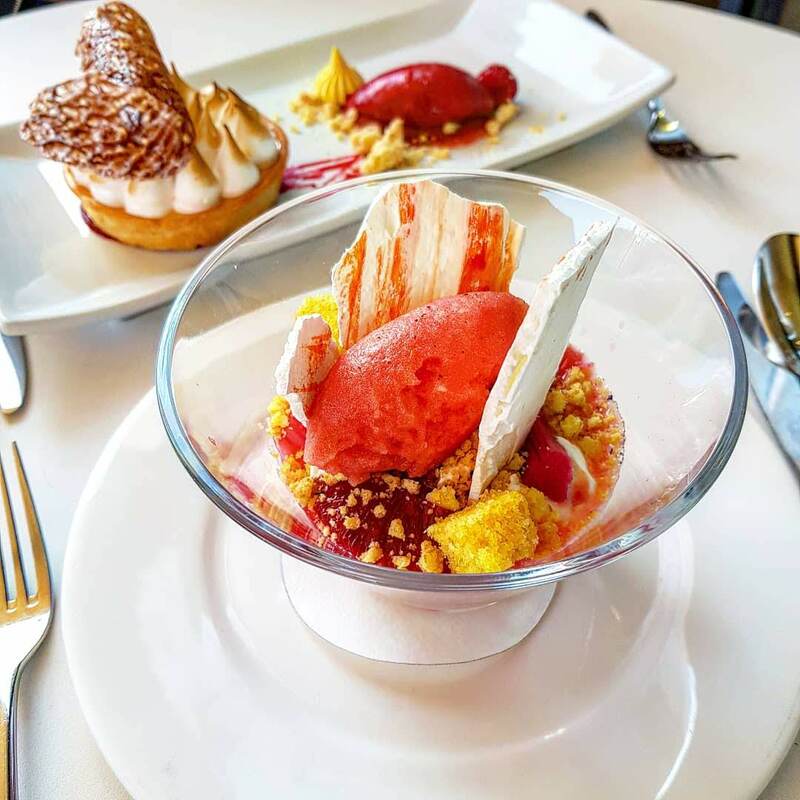 The raspberry sorbet was bold in flavour – a refreshing alternative to classic pairings like cream. This was insane! The Rhubarbe, was a lighter option for dessert, and looked just as fab, and tasted it too. It was a little more on the creative end of the scale, consisting of poached rhubarb, vanilla yoghurt, blood orange sorbet, meringue and timut pepper. It was creamy, yet refreshing with the mix of juicy rhubarb, yoghurt and light sorbet. The meringue adding a little extra texture, and sweetness. 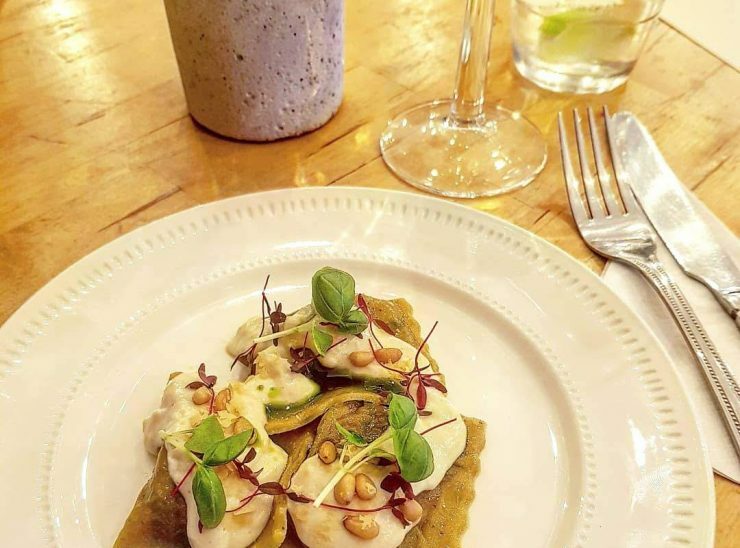 To accompany the feast, there are some fab drinks including an extensive wine menu with a wine connoisseur on hand to offer recommendations to accompany meals. There are 39 pages in the wine menu, with glasses starting from as little as £6. We were recommended a beautiful chenin blanc for the braised ham hock – not too overpowering for the dish which is full of flavour. 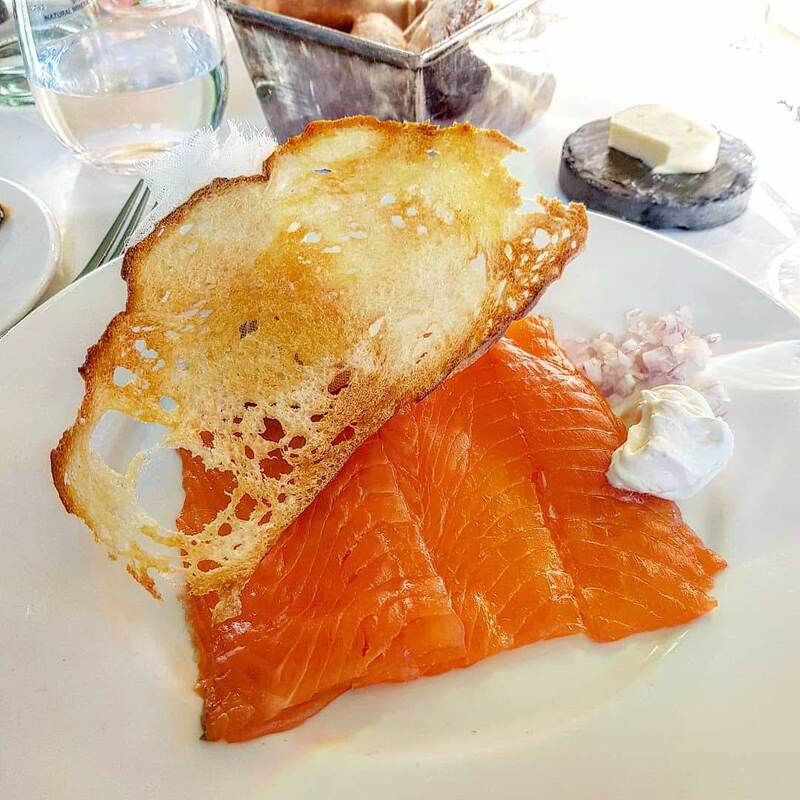 An acidic Muscadet was recommended for the smoked salmon, to bring out the citrus notes of the lemon. It was a delicious pairing. A full bodied, rich Barbera was picked to bring out the flavours in the rabbit. Whilst the stone bass was pair with a a chardonnay, due to its mineral taste to compliment the foam. It was smooth, light and another brilliant white. We loved having our wines paired with each dish. It really helped bring out the flavours, and worked beautifully with each dish. Rather than plucking one out randomly. It’s something we’ll definitely be doing again! We actually got to sit outside on the terrace when we visited, as we were lucky enough to visit one one warm and sunny weekend. It was a lovely spot, and service was fab from the moment we were first seated. Price: It is normally a little pricey, at £38pp for two courses and£43pp for three courses. So one for a special occasion. However, this month, they’re offering 50% off when you quote “hot dinners” when booking. Food: Outstanding. Fab, flavoursome and beautiful dishes. A little on the smaller side. Drinks: So many wine options, as well as others. Having a wine connoisseur is SO good. We loved having our drinks paired with each dish – it really added to the experience. 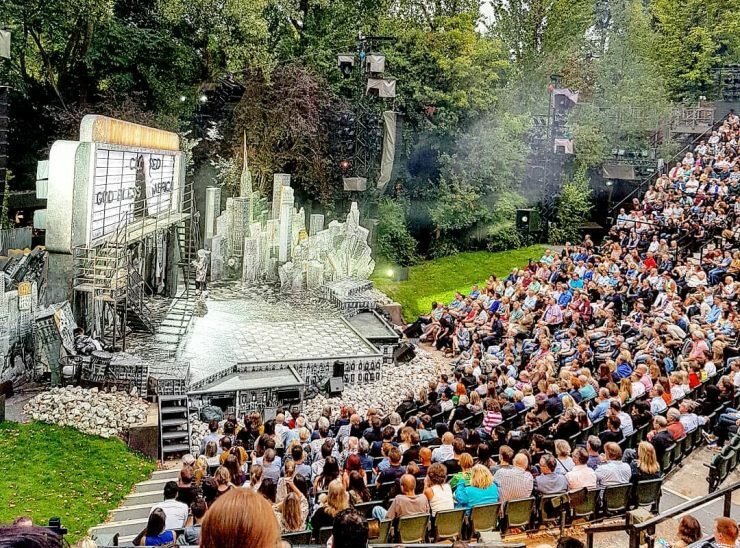 Wait: it wasn’t too busy the Sunday we visited, but do try book if you can! I can imagine it getting very busy in summer with that garden! *I was invited along to review the new menu for East London Girl. All views my own. The food sounds absolutely amazing – given I can see the roof terrace from my desk at work (and can see my window in one of your photos!) I’ll have to go soon!